1. cut around the trumpet & cut extra holly leaves layers to add dimension. 3. Added GOLD ribbon and Gold brads. 4. Highlighted with a GOLD leafing Pen. 5. Sponged edges with Gold Ink and sentiment with Ruby Red Ink. 6. Finished off with Gold Glitter Spray. 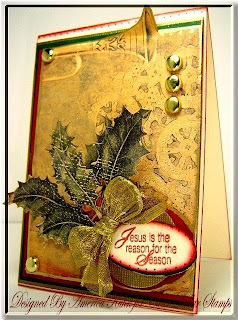 Another stamp set that is also NEW this month at CDS is "Miracle From Above". And I made the following 2 similar cards using the same 2 images from this set. While the colors are also similar on both cards... the techniques, embellishments and tools used on each card are very different. Such amazing cards! I love all the details! These are all beautiful, but I am totally drooling over the first one with the gold accents and the very cool way you cut out the trumpet. Fabulous my friend!!!! The first one is just gorgeous and the other too are just so cute and adorable too!